Following Tony Michell’s decision to step away from 410 Sprintcar driving duties earlier this season, Michell Racing have recently welcomed Ben Hilder as the team’s driver. While it was Tony’s dad Ray who began what would go on to become quite the legacy for the Michell family name, predominantly racing Speedcars throughout 1980s before stepping into Sprintcars in the 1990s, it was Tony who took over driver duties in the late 1990s, with his highlight being an impressive seventh-place finish in the 2006 Australian Sprintcar Championship at his home track: Brisbane’s Archerfield Speedway. Returning to his roots in the 2013 by re-joining the Speedcars class, Ray contested a handful of selected race meetings until once again turning the reins over to Tony, who also competed a total of three seasons before stepping out of the driver’s seat and onto the sidelines, where he’s been ever since. It wasn’t until the beginning of this season that Tony decided the time was ripe for him to make his comeback as a driver amongst the Sprintcar ranks. 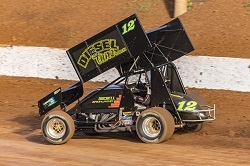 With just two shows under his belt aboard the Qld # 12 Michell Bricklaying / Diesel Tune supported 410 Shaver powered Triple X car, which is owned by Ray, Tony realised that he could potentially be more valuable as a crew chief to a younger driver. Surprised that Ben Hilder, who is the 27-year-old son of Brad Hilder from BHR Fabrication, who has shown plenty of promise throughout his past seven seasons in 410 Sprintcars driving for John Weatherall, was out of a drive for the 2018-19 season, Tony leapt at the opportunity to offer Hilder the position of Michell Racing’s team driver; a decision that has proven fruitful. With the team switching to another Triple X car to accommodate his height, Hilder, who was last season voted the ‘Driver’s Driver’ award within the Sprintcars Queensland club, wasted no time in showing the team why they made the right choice in offering him a drive. Getting some valuable track time over the Christmas-New Year period in preparation for the recent Australian Championship, Hilder exceeded expectations in the prestigious event, which featured the country’s best Sprintcar drivers. Being forced to qualify for the feature race via the B main, Hilder proved that he was up for the challenge, executing an outstanding last-lap pass on father-and-son duo Garry (six-time Australian Champion) and Jordyn Brazier from sixth place to clinch the fourth and final transfer spot. “Ben is a talented young racer, which was evident in his Australian Championship performance and our whole team was rapt to see him earn a spot in Saturday night’s feature race,” commented the 42-year-old crew chief of the small budget team. Planning to contest the remainder of the 2018-19 season Archerfield Speedway schedule, the next outing for Hilder and the Michell Racing team will be this Saturday night (February 9) at the Brisbane venue. The Michell Racing team would like to thank their 2018-19 season sponsors: Michell Bricklaying, Diesel Tune, Landscape Yard & Hardware, and BHR Fabrications. Special thanks must go out to Ray Michell, Brad Hilder, Tony Taylor, Brad Corse, Wayne Simmonds, and Tony’s wife Diana Michell.